With Valentine’s day just around the corner, I decided to share stories around love. This is the best time of the year to find love and create your own success story. 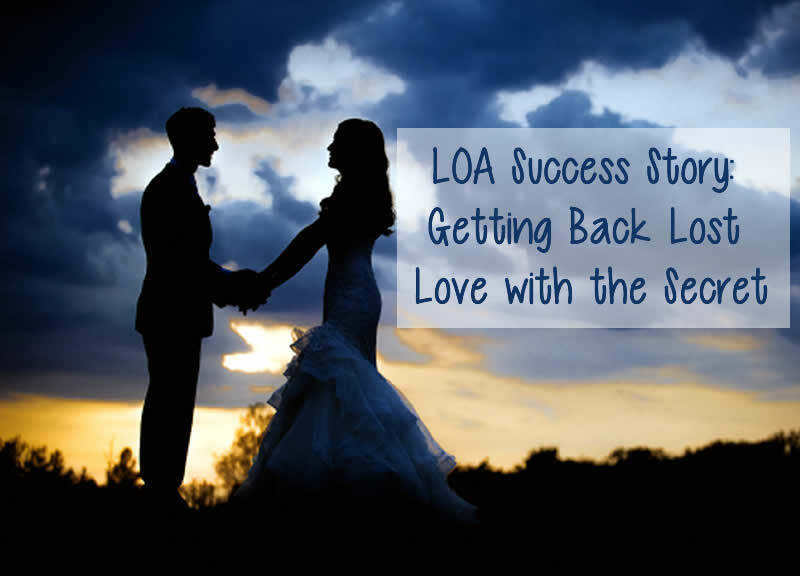 In today’s story the author describes how she used the secret and the law of attraction to get back the love of her life. With powerful tools like visualization and gratitude, the author attracts her ideal life partner back into her life. I would like to express my gratitude to Rhonda and The Secret team. Thank you to all the people who wrote these stories, they are a very important part of my moral support. Sorry about my English, I hope you can understand my story! I met The Secret about one year and a half ago, but I did not implement the teachings until me and my boyfriend broke up. I met this beautiful boy and we had a great time together, the best time in my life. I fell in love immediately, but after only two months we began to fight. I began to think he was not enough for me, I thought he didn’t love me enough and so on. So, we broke up. I was destroyed because he didn’t want to speak with me or see me. I cried for days and didn’t eat for days. I understood that he was the love of my life, the man of my life. I tried to bring him back but nothing was working. I read The Secret, The Power and The Magic so many times. My life began to change. For months, every day, I visualized me and my love together but nothing happened: no messages, no emails, nothing. I decided to let go, to leave my dream to the Universe in order to resolve the situation. I ask the Universe for a lot of signals, like for example, a rainbow, a robin, a yellow ladybird, a unicorn etc. I asked for them if my love and I, would one day be together again. I thought good of myself, I loved myself, I loved my life and my friends. Today after nine months and 19 days after our break, my love told me that he is so sorry about our break up and that he loves me!!! I had tears of joy while I was hearing his words. It all happened in the exact way that I had imagined it would for months!! Now we were together again and I know that our relationship will be great!! I am feeling so blessed and grateful for his love! Thank you, thank you, thank you Universe for my beautiful life, for my beautiful love story!! Thank you for our reconciliation and thank you for healing our relationship. People, never give up! Be grateful and full of love. If I could have my love again in my life after the terrible words he told me when we broke up, anyone can have everything in their life. Nothing is impossible. The Universe know how make you happy!! About the Author: I’m Greta and I live in Italy. I’m a student of art and I love travelling. Thank you Rhonda, thank you to The Secret team. If my life is so beautiful it is only thanks to your teachings. Thank you, thank you, thank you for your job! Love!